This year’s E/AB Fair will gather over 40 exhibitors from around the US, Europe, Japan and South Africa showing their latest publications at The Tunnel in New York’s Chelsea. The Fair will take place 3 – 6 November during New York’s Print Week, to coincide with IFPDA’s Print Fair, and dozens of special exhibitions, talks, and workshops throughout the city. Editions / Artists’ Book Fair (E/AB Fair) has been New York’s premier showcase for the discovery of new and contemporary prints and artists’ books. Renowned for its cultivation of an international community of publishers, E/AB Fair provides a platform for their growth in the art market. Each year the Fair presents a thoughtfully curated exhibition of works by hundreds of emerging and established artists and an informative program of artist talks. Founded in 1998 by Susan Inglett of I.C. Editions, in partnership with Brooke Alexander Editions and Printed Matter, the Fair is now presented by the Lower East Side Printshop, a non-profit organization. E/AB Fair provides free admission in order to introduce broader public to contemporary prints and artists books. “We are delighted to be collaborating with guest curator Joe Amrhein of Pierogi gallery. Joe is a pioneer and has been an ardent champion for artists working in all mediums for over two decades,” says Dusica Kirjakovic, Executive Director of the Lower East Side Printshop and E/AB Fair. “This year one quarter of our exhibitors are joining us for the first time – it’s an exciting moment for us and will surely be one of the most dynamic and energetic E/AB fairs to-date.” Columbia University’s renowned LeRoy Neiman Center for Print Studies, Los Angeles based Cirrus Editions, and Minneapolis-based Highpoint Center for Printmaking are being joined by newcomers including Damien Hirst’s Other Criteria, Art + Culture Projects (New York), Japanese publisher Gallery Jin, and Warren Editions of Cape Town, South Africa. Warren Editions will be showcasing, at the E/AB Fair, particular pieces that the studio specialised in and invested a lot of energy in. The pieces are by artists that the studio respect and developed a relationship with since the start of the studio 9 years ago. The prints by Georgina Gratrix, Dan Halter, Michael Taylor and Diane Victor will be presented at the Warren Editions booth. 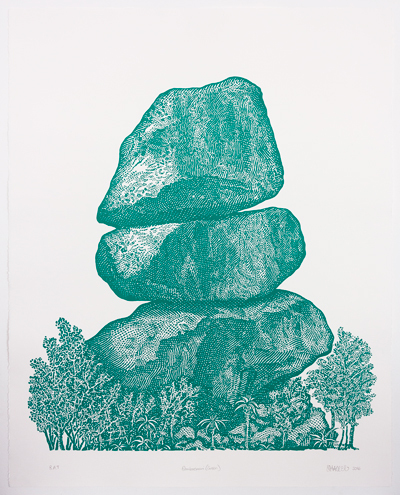 Georgina Gratrix’s prints span 2010 to 2014. 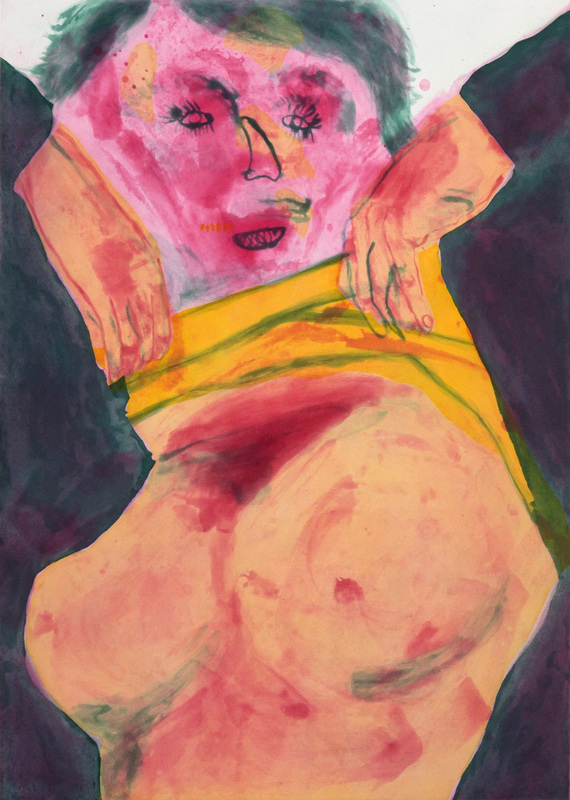 These are amongst others the large colour multi-block woodcut The Flâneur, Miss Lux a pink sumptious spitbite aquatint, another – three plate – spitbite aquatint Bad Feminist. 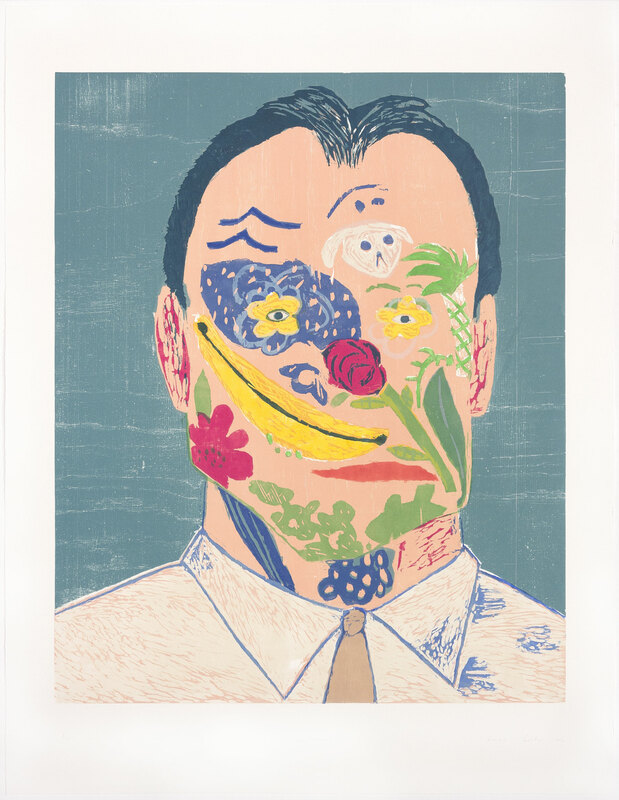 This print is the last left of an edition of 15. While also a provocative etching, the work displays the medium’s painterly ability. Gratrix’s at-the-time unfamiliarity of the medium didn’t deter her focus while constructing the image. The work has often been mistaken for a monotype, because of it’s painterly style. Michael Taylor has utilised the monotype medium extensively at Warren Editions. For the twelve monotypes, on the booth, handmade watercolour was used. 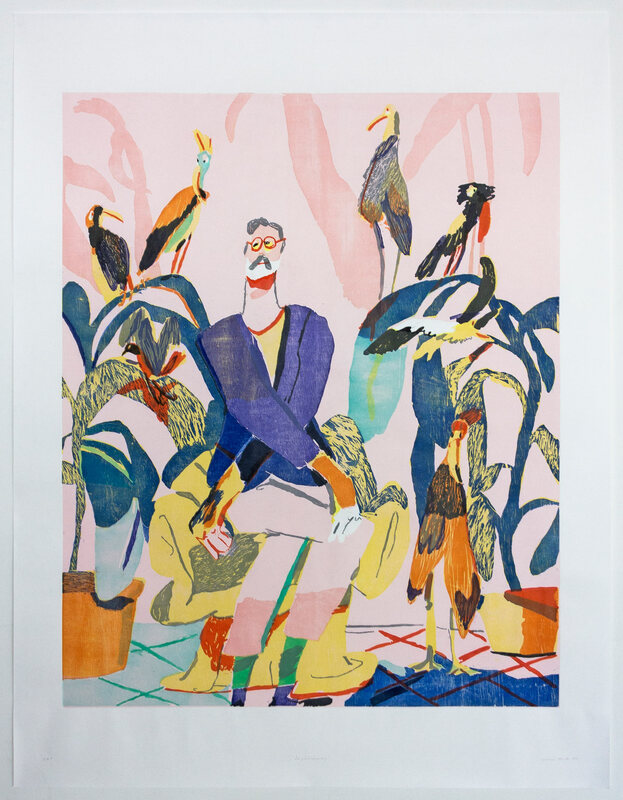 While the focus work on display, In good company is a large multi-colour woodcut, Michael and the studio’s objective was to maintain a painterly feel. The two smaller woodcuts, Pea pod party and Long distance lover are playful explorations of the graphic qualities of the relief technique – employing lino- and woodcut and flat roll. The photogravure medium was introduced into the studio February 2015. This medium was utilised for creating White Noise and One Horn by Diane Victor. She has for the past 20 years been making ‘smoke drawings’. The printer, Zhané Warren gave her Pictorico film (translucent film) to make the smoke drawings onto. Warren advised her to stay clear from making the darks too dense with the soot released from the flame; instead to focus on maintaining the images within the mid-tones range. Victor introduced the highlights with an eraser and clean paintbrush. This drawing/positive Warren exposed onto light-sensitive pigmented gelatin tissue, developed and etched the copper. In the years that Diane has made smoke drawings she has teamed up with printers, from the US and SA, in order to find a method to create a matrix and so pull an edition. Either the method failed or she was never happy with the tones – the prints always lacking the mid-tones and too contrasted. Warren Editions is pleased with the success of the gravures. The large linocut by Dan Halter is based on the engraving of the piled rocks found on all the Zimbabwean Dollars; these rocks are located outside of Harare, the capital of Zimbabwe. The Zimbabwean Dollars have been printed in various colours – many are bright and lends a certain aesthetic to the image of the piled rocks on the note. Halter carved an enlarged version of the rocks in linoleum flooring over a period of a month. The studio’s objective is to make a number of editions each in a particular colour – referencing the bright colours used for the Zimbabwean Dollars. The title Domboremari acknowledges the Shona language and when roughly translated means “the place of money”.